How do you get 62 comments on your blog posts? We didn’t always have systems for attracting the a steady stream of target customers to a blog. It took Benji years of trial and error, reading, and building relationships with experienced marketers to learn systems for what worked. Once he found that though, he first grew Vistage’s blog from 1,000 to 20,000 uniques a month in one year. He didn’t just get any old traffic either, the blog was able to attract CEOs from companies with $5M or more in revenue, and convert them to members of CEO peer groups (Vistage’s “product”) all over the country while lowering the cost per lead by 600%. Then, Benji did this again at ThinkApps, an app development company. When he started as Head of Marketing, ThinkApps had no blog. Plus it was in a technical niche — he had to write about building great web, mobile and wearable products, and attract product managers, CTOs, and CEOs from fast growth and enterprise companies. But more importantly, that traffic converted into customers. He developed a process for capturing leads directly off of blog posts, which led to multiple 5 and 6-figure deals from single posts. Many of you have followed our journey building Grow and Convert from the very beginning, and we’ve thoroughly documented our growth from the start. Only 890 of March’s 23,000 sessions were from organic. That was in 2016. Now, two years later, this single “blog”, which started as a side project, has — to be a little dramatic — changed our lives. …I told you I was being a little dramatic. Side note: We first called it Postable then after Product Hunt and Appsumo, we got angry emails from the owner of Postable.com (a postcard mailing business) to tell us to change the name. I still don’t get what a card mailing service and a blog publishing business have to do with each other, but that’s another story. Second, it of course has enabled the Grow and Convert content marketing agency, which currently does $42,000 per month in revenue and pays both of us well in addition to an editor, content promoter, and a couple very busy writers. Our only marketing channel has been content marketing. We literally don’t do any other marketing. …and we definitely don’t do any “outbound” sales. We even slack off on publishing content but the growandconvert.com engine we built keeps churning for us now: from June 2017 to February 2018 we published only one article per month. One article per month for 8 months! That’s, frankly, embarrassing. But we had to do it to focus on growing the agency and getting awesome results for our clients (which we’re showing below). And all the work we did upfront from content marketing got us over 40 leads in the first month of announcing our agency to our 5,000 person email list and a steady stream ever since. A snapshot of our lead list, intentionally blurred out and size reduced so you can’t see everyone’s personal info. Now here’s what we’ve been doing for clients over the past 8 months. We’ve used the same system we used to grow our business, on our clients, with similar results. Leadfeeder — A funded, profitable, and rapidly growing SaaS company that lets you see what businesses are visiting your website, even if they fill out no form ever, pretty cool. Fieldboom — A self-funded new SaaS company starting from near scratch to build a user base, brand, and get their first users. Inflow — An award winning marketing agency exclusively serving multi-million dollar ecommerce clients whose made the Inc 5000 a couple years in a row. The way we got these results is varied. Each client is targeting different customers, and has different conversion goals. For example for Patreon we wrote engaging, educational stories that highlight their best creators and inspire new ones to also be great. The post above, for example, quickly became one of the top lead generating posts in their entire blog. Leadfeeder and Inflow also had unique content strategies catering to their goals and target customer profiles. All of these results, for our old companies, for Grow and Convert, for our clients, have been achieved by applying the same system over and over again. While we’ve been busy doing everything you’ve just read above, we’ve been testing dozens of content types, promotion techniques and conversion tactics, and we’ve distilled it down to a 6 part system for getting a steady stream of customers through content. We call it the Customers from Content System and we’ve developed a complete online video course to teach it to you. Customers From Content is a 6 module video course, fully online, that you can access from anywhere anytime you like. Most content marketers don’t have a deep understanding of who they’re marketing to. This handcuffs them to producing crappy fluff content forever. 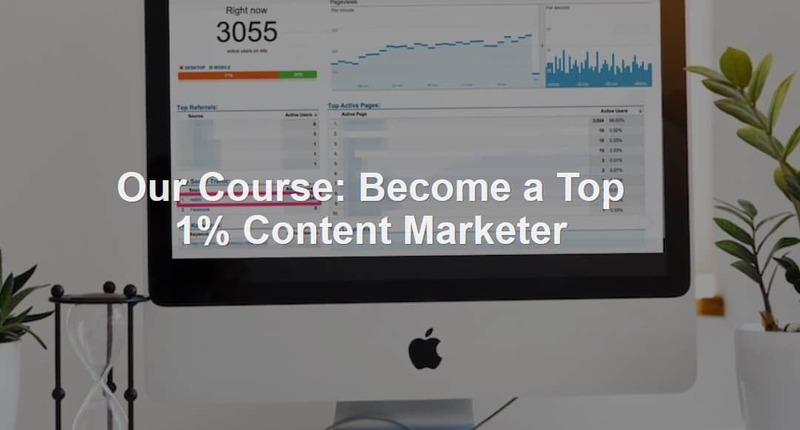 After this module you’ll have the skills to avoid this trap and level up your content. You’ll learn how to narrow down and identify the specific customers for which you should generate content. Here you’ll learn our system for getting beyond “me too” fluff content (like listicles), and produce stellar, specific content that your ideal customers will bookmark, email to each other and share. Should you nurture over email or just ask for a lead? Devesh shares how to use our spreadsheet model to know, with numbers, which route you should take. When should you AB test? Devesh will share his experience and teach you when to worry (and importantly, not worry) about this. Immediately stand out from everyone else by knowing how to attribute leads to content and calculate a cost of acquisition from content marketing. At some point, many marketers will want to scale their content production. This module will teach you how. We’ve tried (and failed) with multiple techniques, but after this module you won’t have to. You’ll learn exactly what’s worked for us. We’ve gone to great lengths to make sure Grow and Convert wasn’t “just another” marketing blog. We made sure it’s received as a premium, advanced content marketing resource. For example: you don’t see any list posts on our site. Almost every post is over 3000 words. Our course, Customers from Content is no different. It’s not a giant list of content marketing tactics – Some online courses or in person training programs are a giant buffet. They list a bunch of tactics you could use for SEO, social media, content marketing, etc. and leave it up to you to pick and choose. Customers from Content is the opposite. In our view, you don’t need a training program to list out tactics — you have the entire internet for that. What created a step change for us was filtering the buffet table of options down to a content marketing system, so our marketing teams could do less scattered work, and focus their efforts on a process that reliably pulled in customers at a low cost of acquisition. And it was repeatable, so we could implement this for multiple clients and multiple companies. 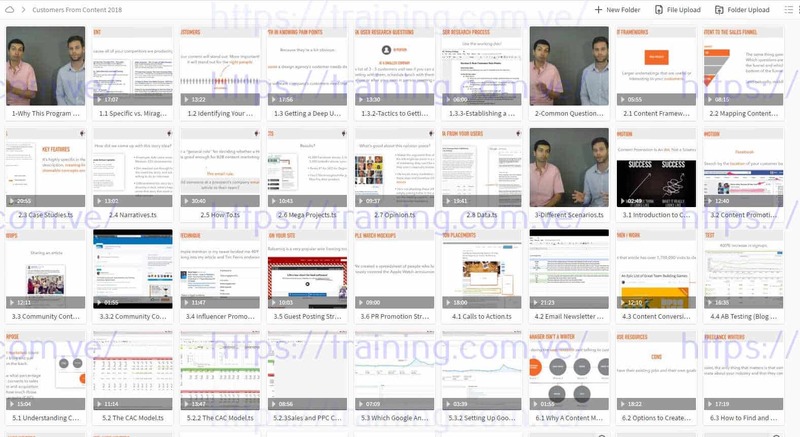 It doesn’t cover low level tactics – Many online courses are painfully low level: for example a social media strategy program that starts by teaching you how to setup a Facebook group or Instagram account. That’s for beginners. Customers from Content is not for beginners. It’s for content marketers who know the basics (how to setup a blog, etc.) and want to be get great at building qualified traffic via high quality articles that in the end drive leads and sales. So we don’t waste your time with tech implementation. We don’t talk about WordPress setup, we don’t talk setting up SEO plugins, we don’t talk about blog post formatting, we don’t talk about technical setup of communities on different platforms. You know this, or can read it in a thousand places for free. That information is also not evergreen. We could cover setting up a Facebook group, but what if another platform is more popular in 3 years (e.g. Slack groups)? Instead, we cover strategy and systems. Not how to publish content, but what content to publish. Not how to schedule social posts, but how to leverage social (or whether to leverage it at all). Not how to set up a community, but how to make sure it has the best people, stays active and engaged, and produces value for members. The one exception is the Google Analytics setup section, which is by necessity tactically detailed. Questions? Chat with us on the bottom right or email us at devesh at growandconvert.com or benji at growandconvert.com.